Halanaerobium praevalens Zeikus et al. 1984 is the type species of the genus Halanaerobium, which in turn is the type genus of the family Halanaerobiaceae. The species is of interest because it is able to reduce a variety of nitro-substituted aromatic compounds at a high rate, and because of its ability to degrade organic pollutants. The strain is also of interest because it functions as a hydrolytic bacterium, fermenting complex organic matter and producing intermediary metabolites for other trophic groups such as sulfate-reducing and methanogenic bacteria. It is further reported as being involved in carbon removal in the Great Salt Lake, its source of isolation. 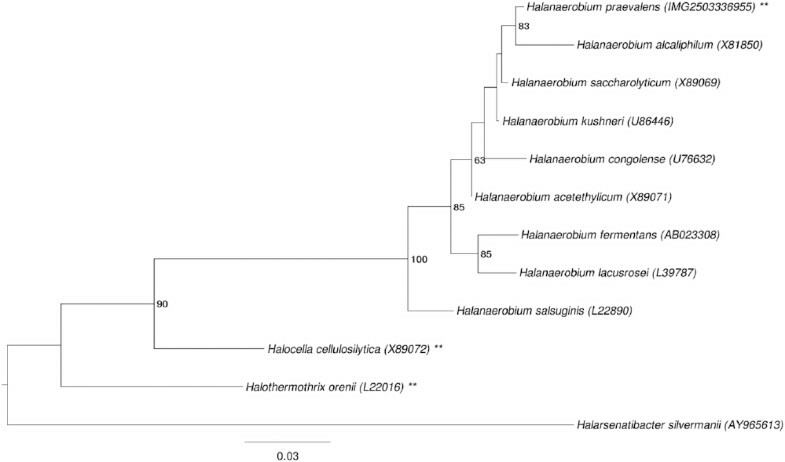 This is the first completed genome sequence of a representative of the genus Halanaerobium and the second genome sequence from a type strain of the family Halanaerobiaceae. The 2,309,262 bp long genome with its 2,110 protein-coding and 70 RNA genes is a part of the Genomic Encyclopedia of Bacteria and Archaea project. Strain GSLT (= DSM 2228 =ATCC 33744) is the type strain of the species Halanaerobium praevalens, which is the type species of its genus Halanaerobium . Originally described as Haloanaerobium , the name was later changed to Halanaerobium to conform with rule 61 of the Bacteriological Code . The genus currently consists of nine validly named species . The genus name is derived from the Latinized Greek word hals; halos meaning salt, the Latinized Greek word an-meaning not, the Latinized Greek word aer meaning air and the Latinized Greek word bios meaning life, yielding the Neo-Latin word ‘Halanaerobium’ meaning ‘salt organism which grows in the absence of air’ . The species epithet is derived from the Latin word ‘praevalens’ (very powerful, very strong, here prevalent) . Strain GSLT was isolated from the hypersaline surface sediments of Great Salt Lake, Utah, USA . Further strains of H. praevalens have been isolated from canned salted Swedish fermented herrings referred to as Surströmming  and probably also from the Red Sea . Other members of the genus have been isolated also from high salt environments distributed worldwide [7–10]. The enzymatic activities of the fatty acid synthetase complex and the D-BAPA (N′-benzoyl-arginine-p-nitroanilide)-ase of H. praevalens have been studied in more detail [11,12]. Here we present a summary classification and a set of features for H. praevalens strain GSLT, together with the description of the complete genome sequencing and annotation. A representative genomic 16S rRNA sequence of H. praevalens was compared using NCBI BLAST under default values (e.g., considering only the best 250 hits) with the most recent release of the Greengenes database  and the relative frequencies, weighted by BLAST scores, of taxa and keywords (reduced to their stem ) were determined. The five most frequent genera were Halanaerobium (81.9%), Halothermothrix (7.8%), Halanaerobacter (2.7%), Acetohalobium (2.3%) and Natroniella (1.9%). Regarding hits to sequences from other members of the genus, the average identity within HSPs (high-scoring segment pairs) was 97.8%, whereas the average coverage by HSPs was 96.3%. The species yielding the highest score was Halanaerobium saccharolyticum. (Note that the Greengenes database uses the INSDC (= EMBL/NCBI/DDBJ) annotation, which is not an authoritative source for nomenclature or classification.) The five most frequent keywords within the labels of environmental samples which yielded hits were ‘microbi’ (9.4%), ‘hypersalin’ (9.1%), ‘mat’ (8.6%), ‘len, miniprim, new, view, world’ (8.5%) and ‘food’ (3.4%). The single most frequent keyword within the labels of environmental samples which yielded hits of a higher score than the highest scoring species was ‘hypersalin, len, mat, microbi, miniprim, new, view, world’ (12.5%). These key words are in line with the ecology and the niche from where strains of H. praevalens have been isolated. 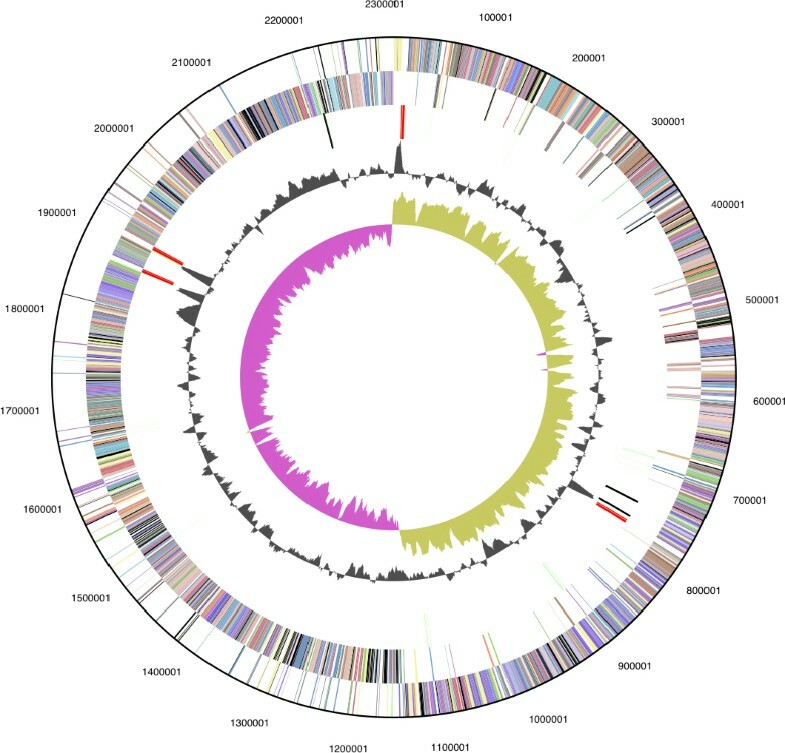 Figure 1 shows the phylogenetic neighborhood of H. praevalens GSLT in a 16S rRNA gene based tree. The sequences of the four 16S rRNA gene copies in the genome differ from each other by up to five nucleotides, and differ by up to five nucleotides from the previously published 16S rRNA gene sequence (AB022034). 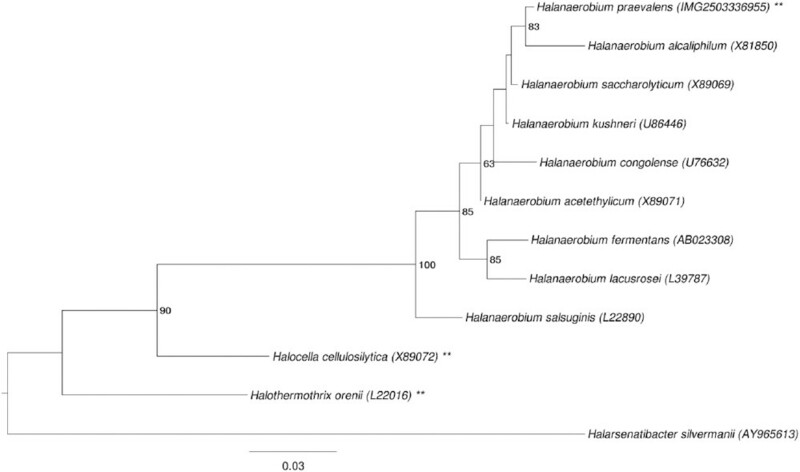 Phylogenetic tree highlighting the position of H. praevalens GSLT relative to the other type strains within the family Halanaerobiaceae. The tree was inferred from 1,460 aligned characters [15,16] of the 16S rRNA gene sequence under the maximum likelihood criterion  and rooted in accordance with the current taxonomy. The branches are scaled in terms of the expected number of substitutions per site. Numbers to the right of bifurcations are support values from 1,000 bootstrap replicates  if larger than 60%. Lineages with type strain genome sequencing projects registered in GOLD  are labeled with an asterisk, published genomes with two asterisks . The cells of strain GSLT are straight and rod-shaped (1 × 2.4 µm) (Figure 2) when grown to the mid-log phase at 37ºC on CS medium containing 12.5% NaCl and 0.5% glucose . When grown at higher NaCl concentrations (> 20%) the cells appear granulated and shorter in length . 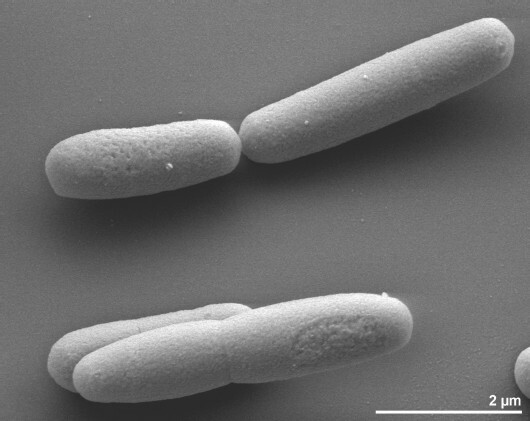 Single colonies were reported as white to translucent in color, 0.5–2.0 mm in diameter, and glistened, when grown on agar plates containing CS medium, 12.5% NaCl, and 0.5% glucose . H. praevalens cells stain Gram-negative  and electron microscopy in thin section revealed architectural features typical of Gram-negative bacteria . However, the positive D-BAPA-ase reaction  confirms its phylogenetic affiliation to the endospore-forming firmicutes (Table 1). In this respect, H. praevalens is able to hydrolyze only the D- but not the L-isomer of N′-benzoyl-arginine-p-nitroanilide (BAPA) . The activity of D-BAPA-ase was highest at low NaCl concentration (100 mM) and completely inhibited at NaCl concentration equal or higher than 1.0 M (∼12%) . Strain GSLT is described to be non-motile, although many flagellar genes have been identified in the genome (see below). Other isolates of H. praevalens were described as motile [5,6], as were other members of the genus [7,9,10], suggesting strain GSLT is atypical with regard to motility. The organism is a strictly anaerobic chemoorganotroph . It grows at NaCl concentrations between 2% and 30%, with optimal growth at approximately 13% . The doubling time is 4 h at 12.5% NaCl and 7 h at 25% NaCl in complex CS medium . The temperature range for growth ranges from 5ºC to 60ºC, with an optimum at 37ºC . The pH range for growth is between 6.0 and 9.0, with an optimum at pH between 7.0 and 7.4 . Strain GSLT is able to utilize carbohydrates (including pectin and N-acetylglucosamine), amino acids, yeast extract, and trypticase; the two latter serving as carbon and energy sources on complex medium . The fermentation of glucose yielded butyrate, acetate, propionate, H2, and CO2 as major products . Also, fructose, D-mannose and maltose are utilized and methionine is transformed to methylmercaptan . Penicillin, tetracycline, cycloserine, chloramphenicol (each at 100 µg/ml culture) or sodium azide (500 µg/ml) completely inhibit the growth of H. praevalens . Strain GSLT was also able to degrade nitro-substituted aromatic compounds such as nitrobenzene, o-nitrophenol, m-nitrophenol, p-nitrophenol, 2,4-dinitrophenol, and 2,4-dinitroaniline . The fatty acid synthetase of H. praevalens is only slightly inhibited at 17.5% and was the first reported to be active in the presence of high salt concentrations . H. praevalens was reported to be involved in carbon sequestration in the Great Salt Lake , since it is present in the sediments of this lake in high numbers (≥ 108 cells/ml) [2,36]. H. praevalens regulates its internal osmotic pressure by the accumulation of salts (Na+, K+, Cl-) rather than by compatible solutes . High concentrations of these salts were measured inside the cells, in sufficient concentration to be isotonic or hypertonic with the medium . Thiosulfate reduction and rhodanese-like enzyme (thiosulfate:cyanide sulfur-transferase) activities also tested positive in strain GSLT . Early in 1987, Matheson et al. established the primary structure of the ribosomal A-protein of the strain GSLT, which is the equivalent to the ribosomal protein L12 from Escherichia coli. Classification and general features of H. praevalens GSLT according to the MIGS recommendations  and the NamesforLife database . When grown on CS medium, at 5% NaCl, more lipids are produced than at 25% NaCl (3.74% and 2.54% of the dry weight of the organism, respectively) . At 5% NaCl, the fractions of glycolipids and phospholipids are 46.9% and 44.5% of the total lipids, respectively. At 25%, the proportion changes in favor of phospholipids (49.1%), whereas glycolipids decrease (43.0%) . The glycolipids consist of a single component diacylglycerol derivative, while the phospholipids consist mainly of cardiolipin (CL), phosphatidyl glycerol (PG), and three minor unidentified constituents . When grown on CS medium, at 5%, the major fatty acids are C14:0 (49.3%), C16:1 (31.3%) and C16:0 (11.4%). At 25%, these fractions change to 36.8%, 39%, and 22.7%, respectively. Similar though more detailed results on the fatty acid composition have been reported recently . H. praevalens GSLT, DSM 2228, was grown anaerobically in DSMZ medium 210 (‘Haloanaerobium’ medium)  at 30–37°C. DNA was isolated from 0.5–1 g of cell paste using MasterPure Gram-positive DNA purification kit (Epicentre MGP04100) following the standard protocol as recommended by the manufacturer, with modification st/DL for cell lysis as described in Wu et al. . DNA is available through the DNA Bank Network . The genome was sequenced using a combination of Illumina and 454 sequencing platforms. All general aspects of library construction and sequencing can be found at the JGI website . Pyrosequencing reads were assembled using the Newbler assembler (Roche). The initial Newbler assembly, consisting of 85 contigs in 31 scaffolds, was converted into a phrap  assembly by making fake reads from the consensus, to collect the read pairs in the 454 paired end library. Illumina sequencing data (360 Mb) was assembled with Velvet  and the consensus sequences were shredded into 1.5 kb overlapped fake reads and assembled together with the 454 data. The 454 draft assembly was based on 401.6 Mb 454 draft data and all of the 454 paired end data. Newbler parameters are -consed -a 50 -l 350 -g -m -ml 20. The Phred/Phrap/Consed software package  was used for sequence assembly and quality assessment in the subsequent finishing process. After the shotgun stage, reads were assembled with parallel phrap (High Performance Software, LLC). Possible mis-assemblies were corrected with gapResolution , Dupfinisher , or sequencing cloned bridging PCR fragments with subcloning. Gaps between contigs were closed by editing in Consed, by PCR and by Bubble PCR primer walks (J.-F. Chang, unpublished). A total of 417 additional reactions and ten shatter libraries were necessary to close gaps and to raise the quality of the finished sequence. Illumina reads were also used to correct potential base errors and increase consensus quality using a software Polisher developed at JGI . The error rate of the completed genome sequence is less than 1 in 100,000. Together, the combination of the Illumina and 454 sequencing platforms provided 375.4 × coverage of the genome. The final assembly contained 838,597 pyrosequence and 12,903,210 Illumina reads. The genome consists of a 2,309,262 bp long chromosome with a G+C content of 30.3% (Table 3 and Figure 3). Of the 2,180 genes predicted, 2,110 were protein-coding genes, and 70 RNAs; 42 pseudogenes were also identified. The majority of the protein-coding genes (77.7%) were assigned with a putative function while the remaining ones were annotated as hypothetical proteins. The distribution of genes into COGs functional categories is presented in Table 4. We would like to gratefully acknowledge the help of Olivier D. Ngatchou-Djao (HZI) for drafting the manuscript, and Helga Pomrenke (DSMZ) for growing H. praevalens cultures. This work was performed under the auspices of the US Department of Energy Office of Science, Biological and Environmental Research Program, and by the University of California, Lawrence Berkeley National Laboratory under contract No. DE-AC02-05CH11231, Lawrence Livermore National Laboratory under Contract No. DE-AC52-07NA27344, and Los Alamos National Laboratory under contract No. DE-AC02-06NA25396, UT-Battelle and Oak Ridge National Laboratory under contract DE-AC05-00OR22725, as well as German Research Foundation (DFG) INST 599/1-2.